Douglas Cooper and Billy McCarty-Cooper at Chateau de Castille, Cooper's house in the South of France. Photograph by Robert Doisneau. The living room of the residence on Oriole Lane with museum quality furnishings and art maintained for preservation standards. Braque's famous Atelier VIII on the left wall, Picasso's Compotier et guitare on the right, among other rare artifacts. Previous photo by Victor Skrebneski. 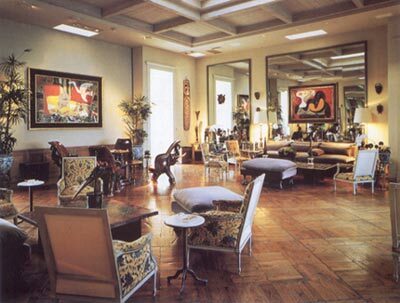 Our client William McCarty-Cooper had a home renowned for its museum quality furnishings and art comprising a style in the great European tradition and salons. Nesa recalls the elegant beauty and laconically relaxed manner of the owner, who's rare contemporary and antiquities mix was much admired by all who visited the impeccably run home. This included the appreciation by the former British Royal Family staff member she placed to oversee its care, who speaks longingly of those memorable days.